20 x 1 oz gold American Eagle coin - 999 fine. 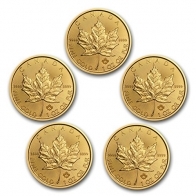 Each American Eagle gold coin contains 1 ounce of 99.9% pure investment grade gold bullion. 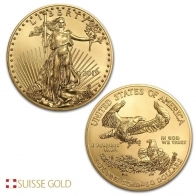 The American Eagle Gold Bullion Coin was introduced into the bullion market in 1986. 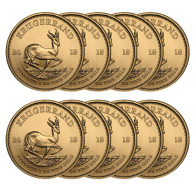 The coin is currently manufactured in 1 oz, 1/2 oz, 1/4 oz and 1/10 oz sizes. Each gold American Eagle features an image of Lady Liberty on the front, with a torch in one hand, and an olive branch in the other. The image of the sun rising is behind her. The reverse of the coin features an image of a male Bald Eagle bringing branches back to his nest. A female eagle is sitting in the nest, protecting her eggs. On the reverse of the coin is the weight and fineness of the American Eagle gold coin. Each American Gold Eagle has a face value of $50 USD. The Gold Eagle is manufactured by the United States Mint. In addition to the gold, the American Eagle is also produced in silver and platinum. The US Mint also produces the St. Gauden gold coin, and the American Buffalo gold coin. Backyear American Eagle gold coins are popular with precious metals investors, particularly those looking to buy gold coins. They carry a relatively low premium over the spot gold price, and are well known worldwide. These coins come in a plastic slip, or tubes of 20 pieces. 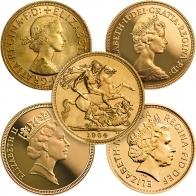 View today's gold spot price here. Please contact us to sell gold Eagles.